Considering its aggregate ranking of 80%, we conclude that the Cuisinart CBT-1500 is currently Alphachooser's best Cuisinart blender 2019. Alphachooser also concludes that our sample of 175 reviews from our sources gives us a high confidence level (more on confidence levels) that justifies calling it a "no-brainer best choice." 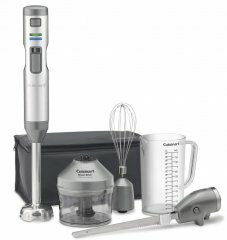 With its 4 stars computed from 219 reviews, here is what we consider second best Cuisinart blender. * Our list is based on a full analysis of hundreds of reviews from around the web. 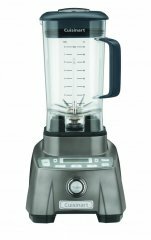 Classic blender with four speeds (high, low, pulse, and ice crush) that also comes with a 48oz thermal shock-resistant glass jar. A blender made mostly to blend and cook soup, with its included heater that can saut?, simmer or boil. Safety-oriented 40-ounce blender that has a 7-speed touch pad with LED indicator lights, a UL-approved stamp, and two light color options (white and pink). This one is perhaps among the most basic of household blenders, with its four programs, but maybe that's just what you need: low, high, ice crush, and pulse. a 1.3-HP blender with three pre-set functions, a count-up alarm timer, and BPA-free tritan jar shaped to create vortices. A baby blender combining a bottle warmer and a baby food warmer that can chop/puree and steam. Basic 56-ounce BPA-free blender with ice crush, smoothie presets and a 3-year warranty.